But I can’t because I’m a co-owner of TheraSpecs, so anything I say makes readers think I’m trying to market my product. In a way, I guess I am, but only because the tint on TheraSpecs provides a better alternative to sunglasses indoors and won’t increase a person’s light sensitivity. The same neurologist who warned me against wearing sunglasses indoors or after dark is the one who told me about the precision tint that filters out the painful wavelengths of light. He has no financial ties to a company that sells glasses with this tint, he just knows it’s a better alternative than wearing sunglasses indoors. Because his suggestion helped me so much, Hart and I decided to make light-blocking frames with this special tint readily available to anyone with light sensitivity. Now I’m in this bind of wanting to share the information that I have — information that could help migraineurs avoid exacerbating a major symptom and potential trigger — while being silenced because some people may think it’s marketing. Yes, TheraSpecs makes great products that help a lot of people, but that’s beside the point. 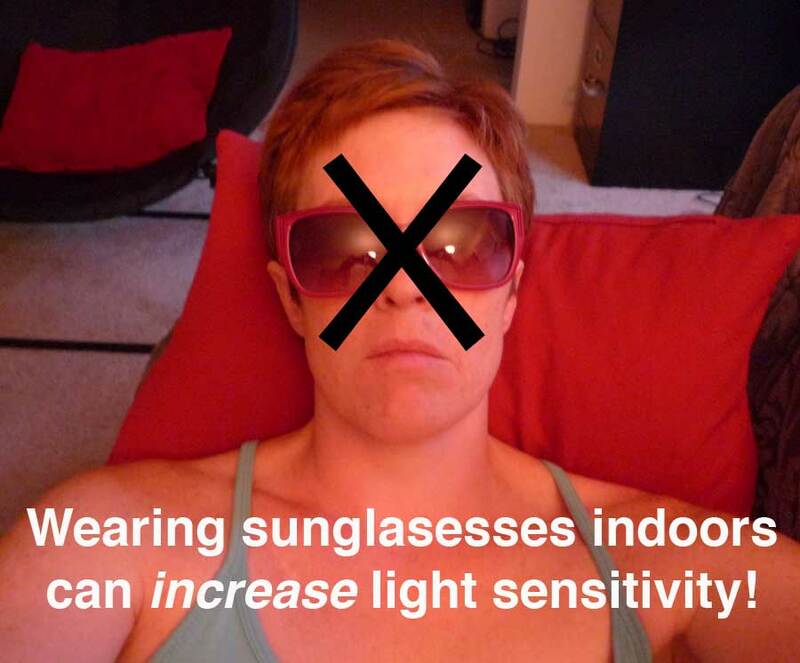 Migraineurs are potentially worsening their photophobia by wearing sunglasses indoors and are encouraging others to do the same — and because of my affiliation with TheraSpecs, I can’t warn them of this risk. It’s so frustrating!